Da Beef wrote: As long as this thread is active I should point out that I saw a second location of Los Barrilitos has opened up on the 4100 block of West 47th street. Thanks for mentioning the Archer Heights location. I was told this Los Barrilitos has been open a year come May. It's well disguised, though. 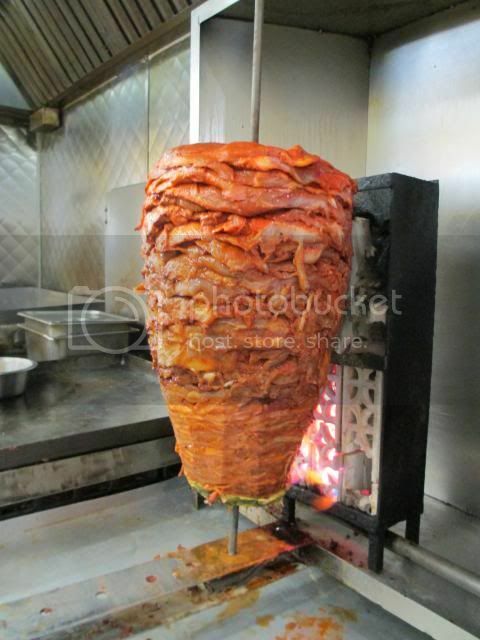 After I placed my order for tacos al pastor they cranked up the flame to crisp the surface of the trompo. As on 25th Street they use a propane tank; presumably the standard gas service isn't sufficient to give them the hot flame they require. Tacos al pastor (all that I tried) are virtually identical to those served on 25th Street—thin shavings of very crispy, minimally seasoned meat served with that addictive onion-habanero mix. This might be my preferred style and these guys are absolutely consistent (in my limited but growing experience). They seem willing to go to a little extra trouble to serve topnotch tacos al pastor every time. So is Taqueria Ochoa the same as Los Barrilitos? Santander wrote: At La Lagartija you have traditional tacos al pastor, with charred pineapple on top of the spit slivered and served over the taco. Again at the right time, they are wonderful, and close to Mexican street food than, for example, Big Star, which also has fruit-topped pastor. We went to Big Star last night (my god, what a mad house). The al pastor was good, and probably near the top (definitely not as good as Los Barrilitos) of my list (so far). But what is the deal with rice flour tortillas? Definitely takes away from the tacos. They should stick with corn tortillas. I would say that Big Star is one of the best hipster approximations of a taco joint in town. If you're looking for real hole in the wall taco joints, I'd say you've still got a lot of ground to cover before making up your mind that Big Star is near the top of ANY taco list. mdpilam wrote: So is Taqueria Ochoa the same as Los Barrilitos? I don't know. At first I thought maybe they hadn't gotten around to changing signage. But the phone number on the Ochoa awning matches that on the Barrilitos business card. If the two businesses are the same you might expect both to be mentioned on the business card. But Taquería Ochoa isn't on the card and the owner's (or manager's?) name isn't Ochoa. Your guess is as good as mine what all this means. I do believe that the two Taquerías Los Barrilitos are related though. the trompo looks great, but what pushed Los Barilitos to the top of my list of spots to his was that bowl of habaneros and onions pictured upthread. i enjoyed this thin shaved style they are doing, a little of the habanero relish and some of their green sauce made for a tasty quick bite. After a single visit, im thinkin the next time I am looking for al pastor in the city its gonna be here not TC, and definitely not Big Star Out west in Joliet I might still prefer Atotonilco over all. 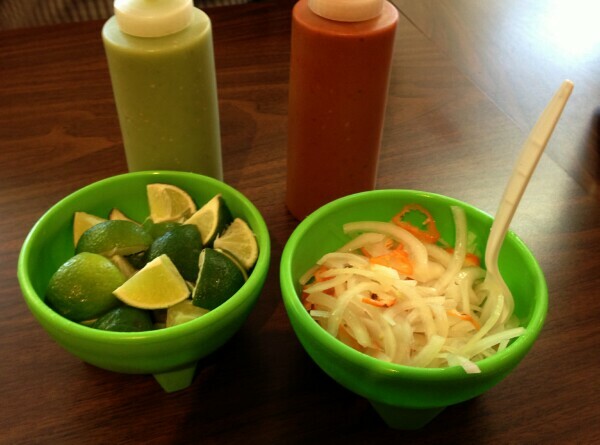 jimswside wrote: the trompo looks great, but what pushed Los Barilitos to the top of my list of spots to his was that bowl of habaneros and onions pictured upthread. And I really liked the habanero/onion mix. Unfortunately the al pastor tacos were so completely over the top salty I could only eat half of one of the three I ordered. I took the rest to go, so as not to offend the nice man and woman running the place. I have a moderately low tolerance for salt, but my two lunch companions were in agreement. I'd guess this was an anomaly or there would not be positive comments on this thread, but with La Chaparrita so close, where I pulled a Kuhdo*, and Tierra Caliente, I don't see going back to Los Barrilitos anytime soon. *Kuhdo = If you don't like your first lunch, have a second. I didnt taste a high salt level on my visit. thanks for the link/reference to La Chaparita, I need to give them a try. Taquería Los Barrilitos #2 (Taquería Ochoa) on 47th Street has closed. Locked and dark on two separate weekday visits, For Rent sign posted, phone disconnected. The original Los Barrilitos on 25th Street is still very much open. Another visit, another topnotch taco al pastor. This guy takes great pride in his work. 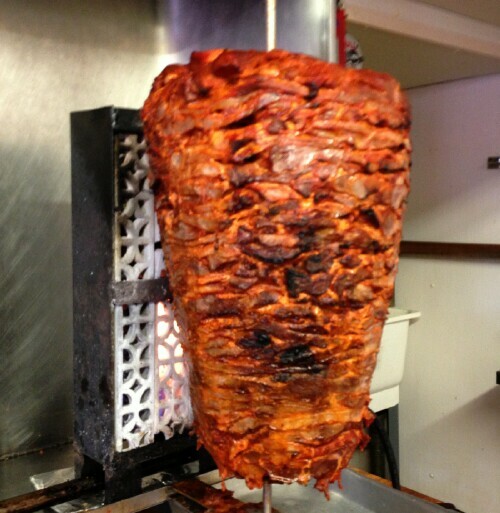 Just look at that trompo! I've been back to Los Barrilitos about 3 or 4 more times since last posting and I have to admit that this place has grown on me greatly - especially after doing some recent taco al pastor excursions to a number of the Southside’s trompo establishments for direct comparision. Although certainly not ideal, the above photo shows some residual Tierra Caliente (Ashland Ave.) al pastor meat (in foreground) taken from a 11:45am visit along with freshly served tacos (2 tacos al pastor/1 taco cabeza) procured at Los Barrilitos about ½ hour later. On this day, at this time, the flavor profile between the two was stark – Los Barrilitos being slightly more salty but clearly having much more vibrancy and depth of flavors to it than Tierra Caliente’s fairly straightforward one-dimensional and lackluster pork. To me, the pork coming from Tierra Caliente is uninspirational – having an almost Chinese velveting texture to it. Limp, really. My guess is that Tierra Caliente will typically marinate their pork longer than most and thus is creating this unappealing (at least for me) texture. I have been to Tierra Caliente numerous times over the years and have almost always (always?) found this to be true, regardless of whether I’m getting pork directly off the spit or from a holding tray. I can see how some might prefer Tierra Caliente’s big chop/chunk style to Los Barrilito’s shaved method – especially given the fact the Tierra Caliente makes tacos as-big-as- your-head. But I’m definitely not within this camp. G Wiv wrote: I don't see going back to Los Barrilitos anytime soon. Positive comments both on and off line from people whose palates I respect drew me back to Los Barrilitos. Pleasing earthy achiote notes, nicely crisp edges an overall good al pastor taco, but still distinctly, to my taste, salty, though not to the level of my first visit. Melty mouth coating cabeza coupled with the bright bite of the house habanero/onion mix will be more than enough to bring me back. Popped into Los Barrilitos the other day for a quick, 2-taco second lunch. I really enjoyed their take on pastor. Thinly shaved bits of richly flavored, fatty, charred pork worked so well with that sweet/hot combo of the pineapple shard and habanero-onion mixture. Though not overly salty per my palate, I can see how the salt-sensitive might reach for an extra Jarritos. Red and green table salsas were also quite solid. My only minor complaint, standard for pastor, is that I would have liked even more char, as I do love my burnt bits. Another diner ordered carne asada and it looked grey, griddled, and generally not worth eating. I think Los Barrilitos is well worth a stop, with the understanding that it quite likely is a one trick pastor pony. I took 1/2 of the team that wrote the book on Austin Breakfast Tacos on a little taco tour of Pilsen and Little Village and Los Barrilitos was on fire that day. Overall the tour was a banging success. We're hoping to do some things in the future with an app that could be fun but in the meantime they're now tackling a second project on 'The Tacos of Texas' which like the first book should be a great read. Da Beef wrote: I prefer my al pastor cut thin and crisp and they do an amazing job with the knife getting it as thin as those electric gyro slicers elsewhere do. The meat reminded me of Saltisa sausage, an old Italian grind that made its way into WI and the UP with immigrants, it has a cinnamon/pork taste to it. My original hunch was spot-on. As you'll hear (mostly in Spanish) in the video I shot below, Master Trompo-Man Jorge uses a not so common blend tracing back to his family in DF. Not only is cinnamon used but so is chile de arbol. Both being somewhat unique compared to the more standard recipes used elsewhere. You'll also notice in the video that they're putting diced pineapples on the tacos now. 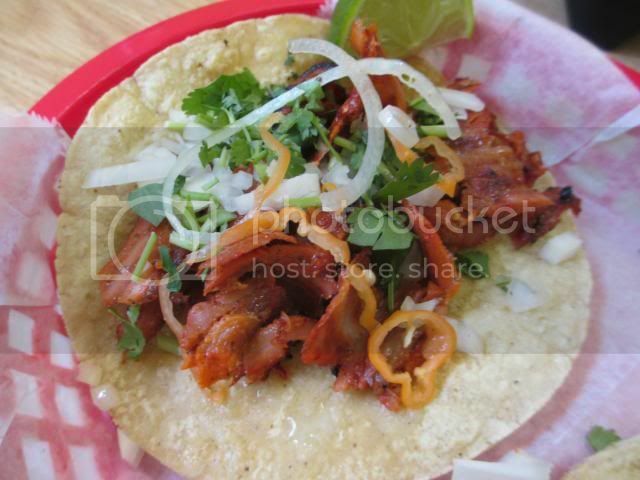 I don't care either way as these are some of the best Tacos al Pastor you'll find anywhere. Always good to see this place getting love - it's my favorite taco in the City (and likely only second to my favorite taco truck in LA). Just had the best $4 lunch I can remember, 3 pastor tacos at Los Barrilitos priced at $1.20 apiece. 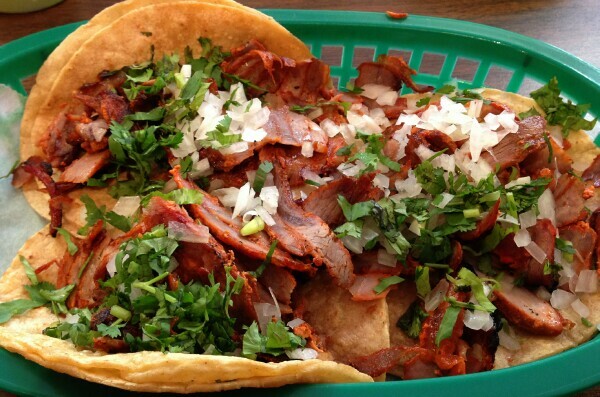 The trompo was fully loaded and crispy, just an excellent version served here. 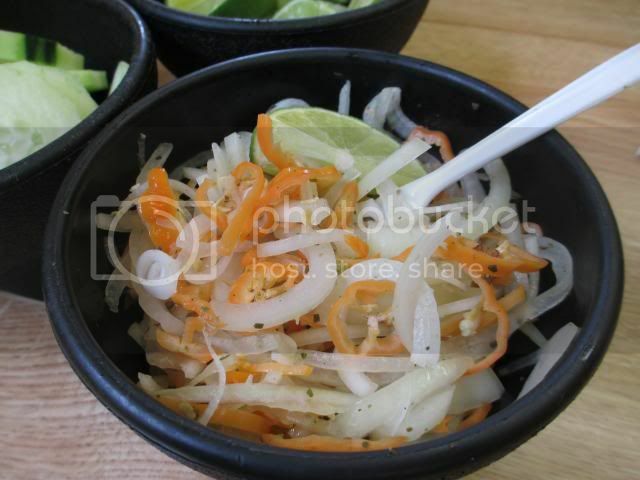 The onions and habaneros served along with the limes and table salsas were sliced a little thicker today than usual, made for a nice spicy kick on the tacos. Glad to see the restaurant was full around 12:15, and we had prompt friendly service as always. Los Barrilitos is as good as ever. Stopped in to do a little "research" on a project I'm working on, and had 3 al pastor tacos and one chorizo. The al pastor is so good; the nice lady seemed a little shocked that I didn't want any asada (which I normally do get there, but was trying to save room for dessert later). Does anyone know if they just serve tacos? And are there other meats besides: asada, al pastor, chorizo, cabeza, tripas, ??? mdpilam wrote: Los Barrilitos is as good as ever. Stopped in to do a little "research" on a project I'm working on, and had 3 al pastor tacos and one chorizo. The al pastor is so good; the nice lady seemed a little shocked that I didn't want any asada (which I normally do get there, but was trying to save room for dessert later). Haha, I forgot, and didn't realize I didn't get their "menu" when I was there. 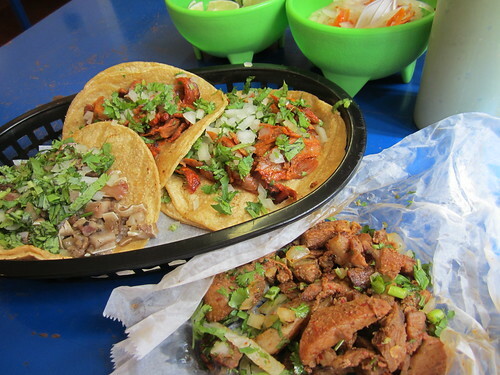 Nothing but tacos, and nothing but those meats--and even some of the ones besides the al pastor run out! Over three years since anyone's bumped the thread on possibly the best al pastor tacos in Chicago? Hopefully not due to a lack of LTH visits to Los Barrilitos. 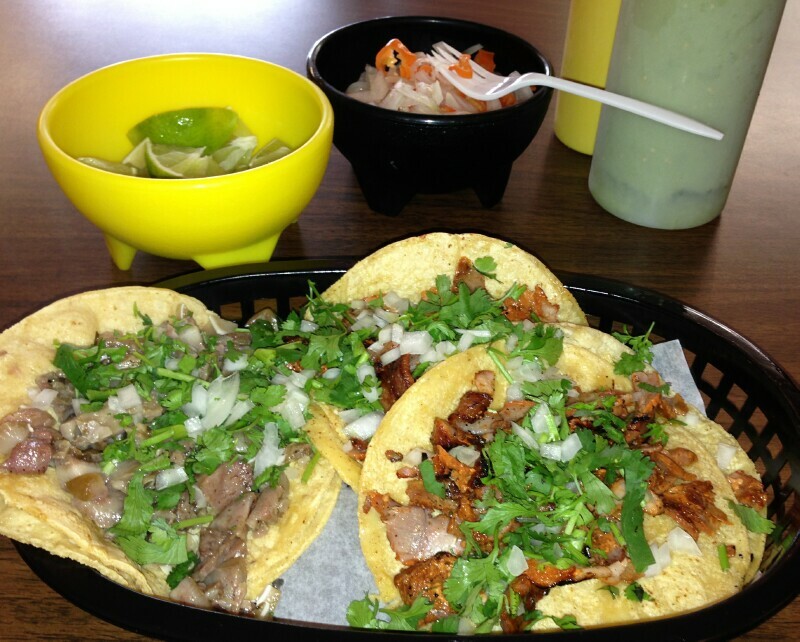 Not much has changed - same stellar al pastor tacos, same great bowl of onions and habaneros, same friendly service. Price is up to $1.70 per taco, which is still a bargain. Sound glad to hear that no news is good news! I had begun to worry this place had fallen off. No al pastor in town quite like that one.